Joymasher, the studio behind Oniken (our 2012 Game of the Year) and Odallus: The Dark Call, returns with Blazing Chrome, a run-and-gun inspired by the likes of Contra and Metal Slug. The game can be played alone or with a friend in 2P co-op, with players selecting between a human member of the resistance named Mavra, or a rebel robot named Doyle in the apocalyptic world of 21XX. 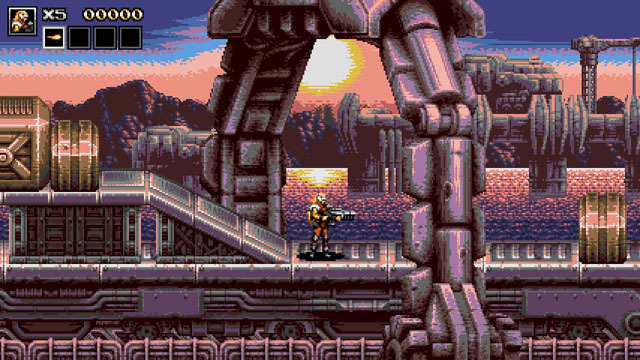 Players use machine guns, rocket launchers, and lasers to blast grotesque alien and robot creatures with a style very reminiscent of Contra III: The Alien Wars, with its dark cityscapes and barren deserts, angled platforms, the ability to hang and shoot simultaneously, and of course, its stylish detailed bosses. The game is headed to PC but does not yet have an announced release date. To find more promising 2D games currently under development, be sure to check out our Master List.